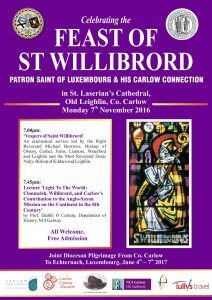 The evening in St. Laserian’s Cathedral will begin at 7.00pm with ‘Vespers of Saint Willibrord’ an ecumenical service led by the Bishop Michael Burrows, and Bishop Denis Nulty. This will be followed (7.45pm) by a lecture by Prof. Dáibhí Ó Cróinín, Department of History, NUI Galway on the history and importance of Clonmelsh, Willibrord, and Carlow’s Contribution to the Anglo-Saxon mission on the continent in the 8th century. Since the early 1980s Prof Ó Cróinín has been researching and publishing articles on the connection with Carlow and the continental missions. In 690AD Willibrord led a successful mission from Carlow, made up of Irishmen and Englishmen. As part of his abbey in Echternach he established a very important scriptorium and for a considerable period of time the Abbey produced many of the bibles, psalms and prayer–books that are to be found today in the great libraries of Europe. It is likely that the first generation of these scribes were from Co. Carlow or had trained here. Many of the earliest Anglo-Saxon manuscripts were written in Irish script either by Irish monks based in Britain or by Anglo-Saxons who were trained by the Irish. From Echternach he continued to co-ordinate missions to the surrounding countries until 739AD, when he died aged 81.